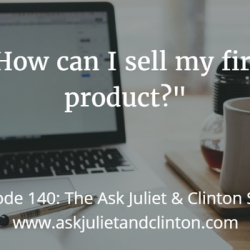 This is the final episode of the Ask Juliet and Clinton Show. In this episode, Juliet and Clinton review the top 5 of the 150 episodes they have published. Get access to our free and fee-based trainings and join our private Facebook Group for therapists and wellness professionals. 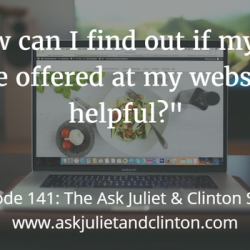 In this episode, Juliet and Clinton answer the following questions: 1) How do I get people to join my group on Facebook? 2) How often should I write a blog post? And 3) My website was hacked. Will my SEO ranking in Google restore to the first page now that it is fixed? Episode 148: What are short-term marketing strategies that bring immediate results? 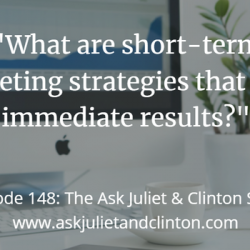 In this episode, Juliet and Clinton answer the following questions: 1) What are short-term marketing strategies that bring immediate results? 2) Should I build my course or email list first? And 3) Is it ethical to contact previous clients as a marketing strategy? 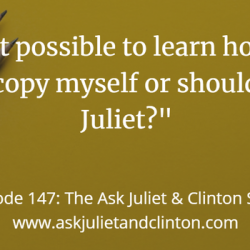 Episode 147: Is it possible to learn how to write copy myself or should I hire Juliet? 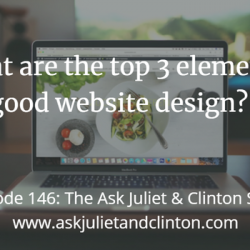 In this episode, Juliet and Clinton’s guest – web designer, Kat Love, answers the following questions: 1) What are the top 3 elements of good website design? 2) What are the most common design mistakes you see on therapist websites? And 3) What design features are more likely to get users to take action? 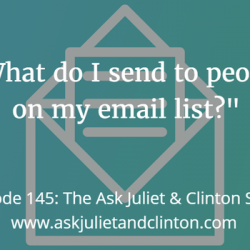 In this episode, Juliet and Clinton answer the following questions: 1) What do I send to people on my email list? 2) How do I start to change my marketing to target a new niche? And 3) What is the best way to add more income to my business when I have a full practice? Episode 144: Do I need to get a part-time job to improve my private practice cash flow? 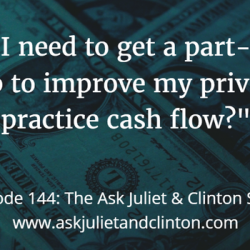 In this episode, Juliet and Clinton answer the following questions: 1) Do I need to get a part-time job to improve my private practice cash flow? 2) How much and where should I invest in marketing my practice? And 3) How much money should I have in my private practice emergency fund? 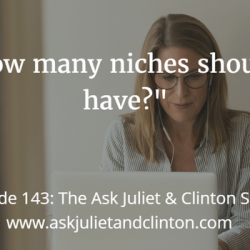 In this episode, Juliet and Clinton answer the following questions: 1) How many niches should I have? 2) How do you manage your marketing time when you have a busy practice? And 3) What is the best platform for offering online courses? Episode 142: Should I be marketing my private practice on LinkedIn? 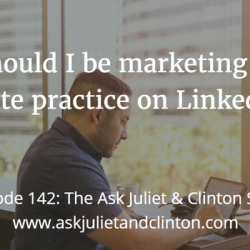 In this episode, Juliet and Clinton answer the following questions: 1) Should I be marketing my private practice on LinkedIn? 2) Is it worth starting a Youtube channel? And 3) What’s the best marketing strategy for Facebook Ads?